Introducing GKhair Bombshell Series - Intensive Hair Rejuvenation and Nourishment Exclusively for Blondes! Home / GKhair Events / Introducing GKhair Bombshell Series – Intensive Hair Rejuvenation and Nourishment Exclusively for Blondes! GKhair introduces the Miami Bombshell – a salon professional smoothing treatment for blonde hair that fully repairs hair damage from styling, coloring and excessive heat. This amazing salon-only treatment aims to fully tame your hair, making it extra smooth and manageable by infusing superior nourishment to each and every hair strand. It efficiently strengthens the hair by filling in the cuticles with Juvexin and premium natural oils. Juvexin, a unique anti-aging protein blend, is GKhair’s signature ingredient specifically optimized to strengthen the hair. See the full video from Beauty World Dubai. GKhair’s newest blonde taming treatment, the Miami Bombshell was a show stopper! 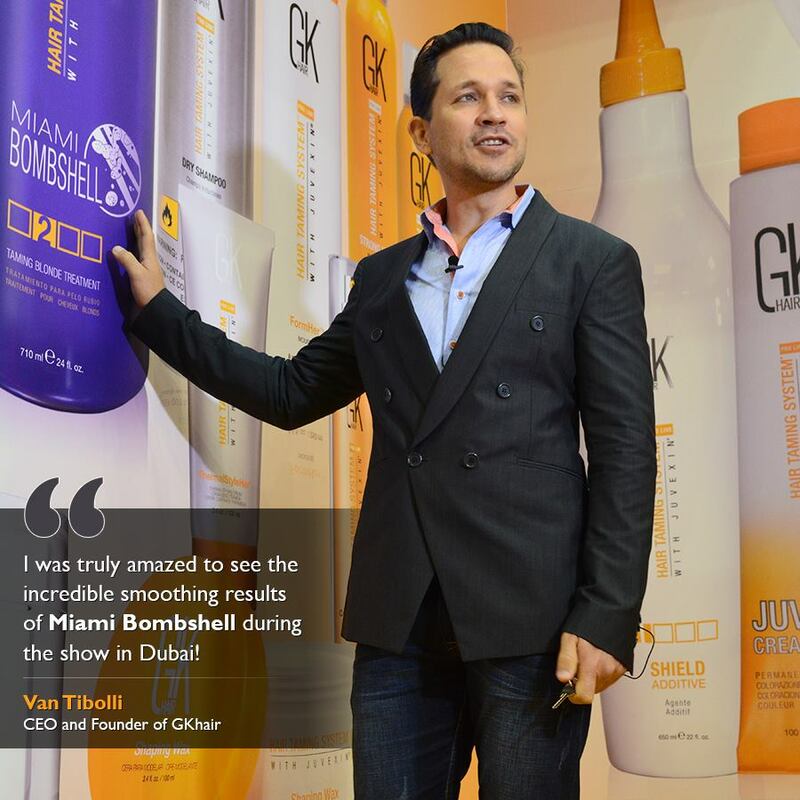 “I was truly amazed to see the incredible smoothing results of Miami Bombshell during the show in Dubai!” said Van Tibolli, Founder and CEO GKhair. Miami Bombshell is a smoothing treatment formulated specifically for blondes to tame hair, repair and neutralize unwanted brassy tones in the hair. Make sure to follow @GKhair on Instagram and Like Us on Facebook.com/GKhair to see Miami Bombshell before and after photos!